The Bryant High School basketball teams begin the final leg of their farewell tour of the[more] 7A/6A-Central Conference tonight when the Hornets visit Little Rock Catholic and the Lady Hornets travel to Mount St. Mary Academy. Bryant will be moving to the South Conference next season so for at least the two years of the current realignment, won’t be facing the other teams in the Central with conference standings on the line. Both the Hornets and Lady Hornets are coming off key victories at home against their respective counterparts from Little Rock Central and they both won at home to start the league slate against tonight’s foes. The Hornets hope to continue their trek up the ladder in the conference, coming in as one of four teams tied for third. But the Rockets are just a game behind that pack. They too defeated Central for their last victory before a 2-point loss to Conway last Friday. 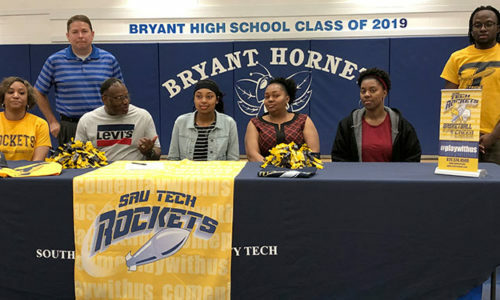 The Catholic High gym has been a difficult place for past Hornets teams to prevail but this is a Bryant group that has been setting new standards for the program. The Lady Hornets are alone in fourth in the conference after their win over Central. In the earlier meeting, however, they had to go to overtime to get past Mount St. Mary’s Belles by 2 points. To date, that’s the closest the Belles have come to winning a conference game so there’s little doubt they’ll be fired up for the rematch in their unique McCauley Center chapel-turned-gym.